Whatever your health or social care interests, the School has relevant accredited courses. Our courses provide you with the knowledge and experience needed to embark on a professional healthcare career; the practical and clinical aspects ensure that you are fully equipped with the skills you require. 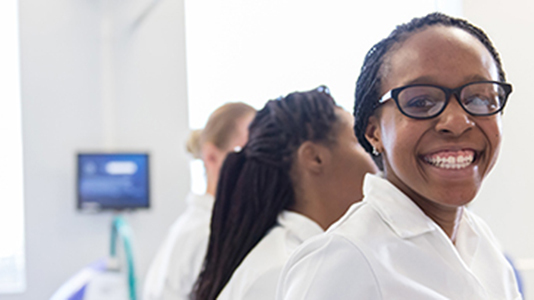 We are one of the largest providers of clinical education for allied health and related professions in the UK, teaching across six professional discipline areas. Within the Department of Advanced and Integrated Practice; our students are placed at world-renowned hospitals in London and the South East, including the Evelina London Children’s Hospital and Great Ormond Street Hospital. The Institute of Vocational Learning is well known across London for delivering timely, responsive training for both healthcare support workers and bespoke skills training for qualified staff. Within the Department of Advanced and Integrated Practice, our focus on applied practice gives our students the in-depth experience they need to build careers in a thriving and important profession. Within the Department of Advanced and Integrated Practice, we work closely with service users, our students are able to access a diverse range of placements within primary and community care settings.